Broderbund, online at broderbund.com, has been offering quality and educational software for over 30 years. Broderbund offers a wide array of affordable software and education solutions for many areas of life, including games and entertainment, design and print software, business and home office software, For Dummies software, kids' software, education software, legal solutions, typing software, and more. Broderbund carries titles like Mavis Beacon Teaches Typing, The Print Shop, PrintMaster, Hoyle Card Puzzle, Honestech Audio Recorder, Carmen Sandiego, Oregon Trail, and many more. But before you shop, get all the latest Broderbund.com discounts, Broderbund promotions, and Broderbund coupon codes found here at RetailSteal.com. Broderbund ships to the United States and Canada. Shipping rates are based on shipping method and destination. See site for more information. Use our coupon code online at Broderbund today and receive 30% savings on purchases of $75 or more. Click link to shop. Enjoy 20% savings on any purchase from Broderbund using coupon code. Shop today and save on titles like Mavis Beacon, For Dummies, Hoyle Card Puzzle, and more. Save up to 75% on select Broderbund software on clearance at broderbund.com. Click here now to shop and save. Enjoy free shipping from Broderbund on purchases over $30. Click here to shop. Save 25% on and receive great deals on your next Broderbund purchase when you sign up for their email newsletter! Use our coupon code at Broderbund today to enjoy a $15 discount on purchases of $49 or more online. Click our link to shop now. Use our coupon code online at Broderbund today to enjoy a 10% discount on merchandise. Click our link to shop now. 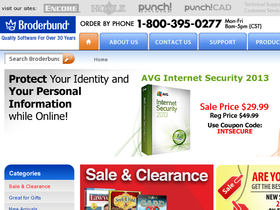 Save $30 on all purchases of $99 or more from Broderbund online today. Enter our coupon code at checkout to enjoy this discount.